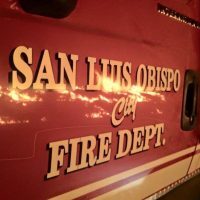 At about 7:15 p.m., fires were reported burning on both the north and south sides of where the railroad tracks intersect Orcutt Road. The blazes started about a quarter mile apart from one another during a time in which no trains were passing through the area, Fire Battalion Chief Bob Bisson said. Trash and debris along the railroad tracks caught fire as a result of the blazes. The fire on the north side of the tracks burned a debris pile that also included what appeared to be an oxygen-acetylene tank that would be associated with a small welding rig, Bisson said. Firefighters managed to quickly contain and then extinguish the blazes. One commercial building in the area sustained smoke damage. The railroad tracks did not sustain any significant damage. At the time the fires broke out, railroad company crews were working along the tracks. Firefighters notified them of the situation, and there were no reports of any injuries. On Thursday morning, firefighters will take a closer look at the debris piles that burned. An investigation into the fires is ongoing.